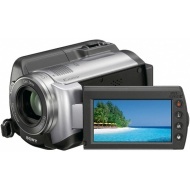 alaTest a collecté et analysé 10 avis de consommateurs et d'experts pour le produit Sony Handycam HDR-XR106. La note moyenne du produit est 4.6 sur 5, tandis que les autres Caméscopes ont une note moyenne de 4.0 sur 5. De nombreux avis apprécient la taille. La batterie impressionne, mais de nombreux avis sont moins positifs sur le viseur. Après analyse des notes de consommateurs et d'experts, de l'âge du produit ainsi que d'autres facteurs, et comparé aux autres Caméscopes, le Sony Handycam HDR-XR106 obtient un alaScore™ de 81/100 = Très Bien. Easy to handle, light weight, max storage, easy to connent to TV PC LAPTOP, having differnet conection cables. Low image quality, vedio quality, the overall image quality is low with compare to price and advance technology era. No Cold shoe for a sound mic. I love the size, shape, ease of use and general functions of the camera. I feel the only bad thing about the camera is the time it takes to get used to the touch screen menu. It isn't too much of a problem but often I found myself scrolling through pages of icons to find what I wanted and found it a bit cryptic. Bad points - you must be joking.